Regardless of the type of music you produce, incorporating templates in your workflow can be a great way of saving you time and improving your efficiency. In this post I am going to give you some examples of templates and give you a brief walkthrough of how they are created. Before you can reap the benefits of a composition template, you are going to have to do a little homework. For writing purposes, the goal is to have access to all of the sounds that you will want to use on a regular basis when writing in a particular genre. 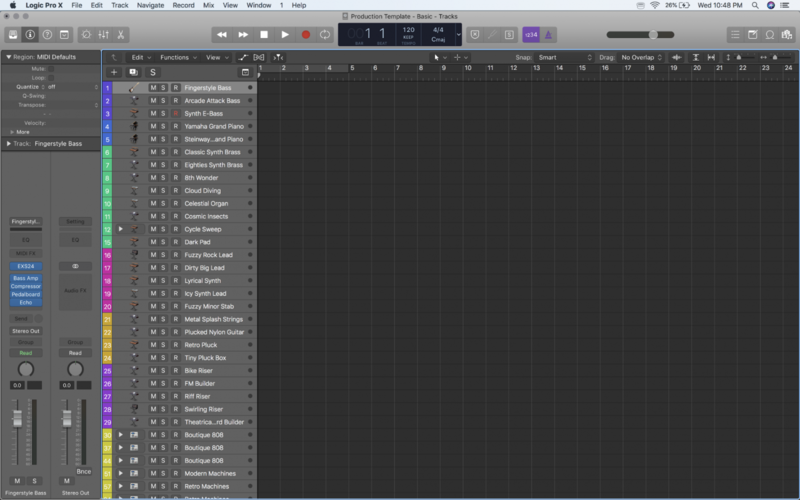 So for starters, take some time to play through and get your sample libraries in order. This can take days or weeks depending on the size of your collection and the amount of housekeeping you have been doing in between new purchases. I realise this may seem overwhelming and tedious but the good news is that once you’ve gone through the process you only have to repeat the process for new purchases in the future rather than your entire sample library. As you play through your sounds, take notes (I did say this would be homework after all) on things that catch your ear and jot down some keywords that describe how you might want to use them. You can do this in a notebook or a spreadsheet, whichever you prefer. Most importantly, be sure to give yourself an easy way of finding them later on. On that note…during the process of auditioning sounds, you may find that your libraries could be better organised. Try organising libraries by instrument, developer and or genre and take advantage of any tagging systems that programs you use may have. Kontakt’s quickload feature is also a great tool especially for organising third party virtual instruments that are not compatible with the free Kontakt player. Now that you are more familiar with your libraries and know what you like it is time to get to the work of actually building! Start with a blank session and begin populating it with instruments in categories relevant to the genre you will be using the template with. 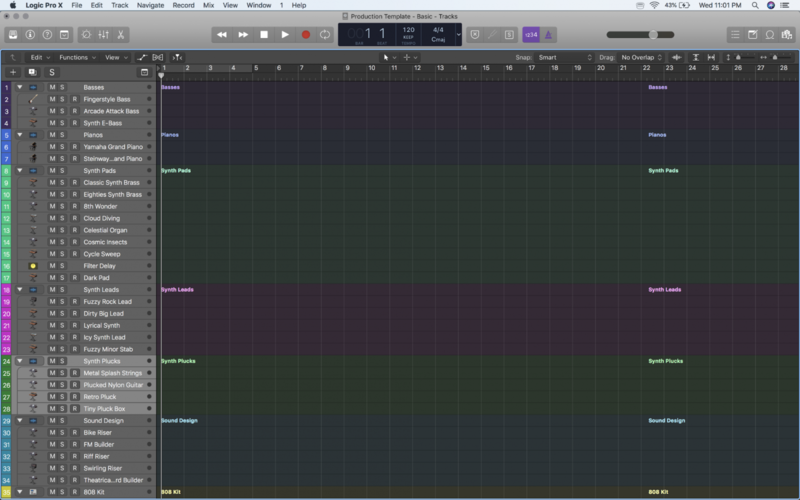 Colours help to keep things organised so I recommend assigning a colour for each type of instrument you use rather than colouring each track individually, though this is admittedly a personal preference. Folders are a great way of organising things even further and absolutely essential for large templates. To put the finishing touches on a template I recommend going the extra mile and routing instruments to busses to great groups. 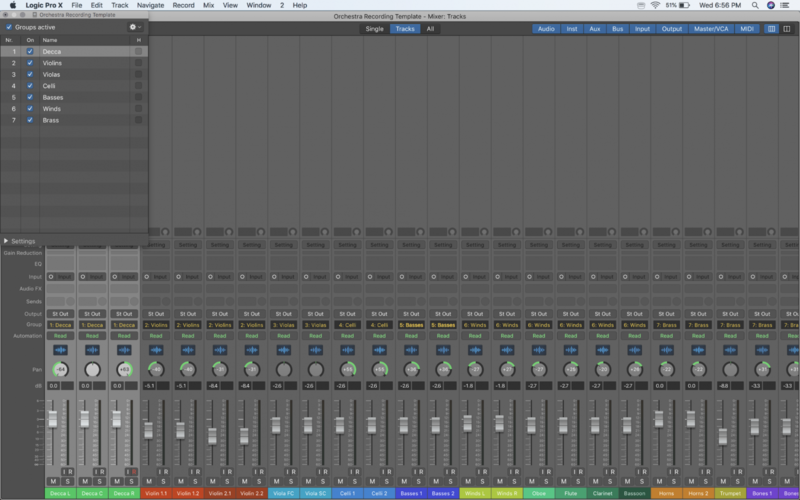 This will make it a lot easier when it comes time to mix down the line. I also like to include a couple of basic effects like compression and EQ on each group to help me refine the sound and glue each section together. Depending on your workflow you may also want to include some processing on the mix bus, some people like that. But I tend to do that later on at the mix phase. With all the virtual instruments and fx options we have available today it is easy to get carried away and stuff your template with everything imaginable only to discover hours or days into the process that your system can’t handle it. As you add new elements to your template, pay attention to your computer’s resources to make sure that you are not being unrealistic. Some DAWs feature a “disable track” feature which allows users to keep their instruments in their project without the resource burden. This can be a valuable tool when building templates so dig a little deeper into your program’s documentation to see if this option is available. The benefits of templates aren’t exclusive to composition. Busy recording and mixing engineers also take advantage of the power of templates to streamline their workflows and keep their productions organised. I often record orchestras and large ensembles for film and game soundtracks. There are many occasions where I might be tracking the same configuration of musicians for several days in which case I will most likely be using the same mics and placement. One of my favorite places to record, Georgian Film in Tbilisi, Georgia has a great live room, but unfortunately very little in the way of equipment so each time I have sessions there I have to cart all my gear in and wire it up, making it essentially a location gig. After spending half a day with my team laying cables and connecting interfaces and preamps we get on to the business of setting up the sessions for the day or days to come. 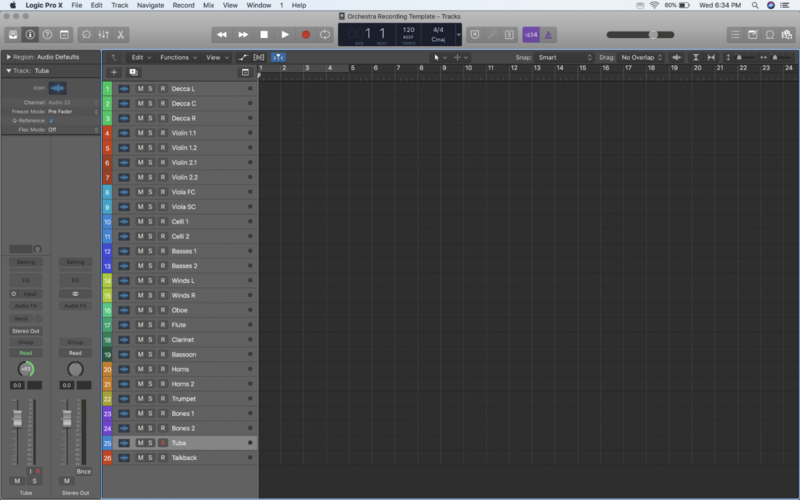 I’ll start by creating a new session and populating it with however many tracks I’ll need. For orchestra that tends to be between 18 and 24 for me depending on the ensemble and the sound I am after. Once all my tracks are in the session I give them all descriptive names and colour them to make things easier to identify. Not that it is important but I also keep capitalisation and spacing consistent throughout the project but anybody who has ever worked with me in a studio environment knows how crazy I am about these little things. If I have specific microphone types that I want to remember I sometimes also include them in the track description. For example “Cello Ribbon” or “Cello Tube”. This may help me make informed decisions later on in the mix process or even help with troubleshooting if an input goes bad. 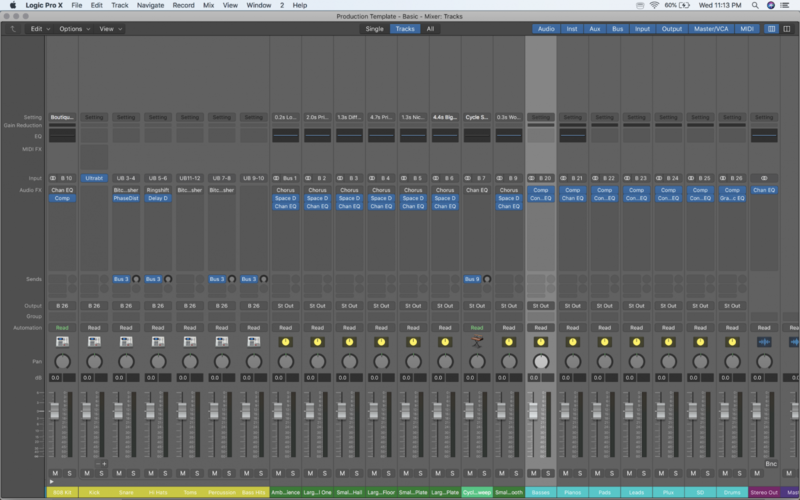 With the tracks populated, named and organised I then move on to the i/o configuration. In this process it helps to have an assistant help out, especially in the case of large multi-mic sessions. In the best case scenario this process won’t take too long as I would have the mics connected according to an input list I gave my assistants. However, due to bad inputs, or other unforeseen factors we are sometimes forced to change things on the fly and adapt. With the tracks, inputs and outputs configured the last thing I’ll do is come up with a basic mix by panning the tracks close to how I would in a mix. I’ll set basic levels, which I may tweak over time as I refine preamp settings and mic positions throughout the session. And I will also create several groups that make monitoring specific sections of the ensemble a lot easier in a big multi-track session like this. For orchestra I don’t usually bother with effects because the spaces I record in have excellent natural reverb, but when recording singers or smaller ensembles in dryer studios I usually throw an appropriate reverb on a send both for my and the musician’s monitoring purposes.